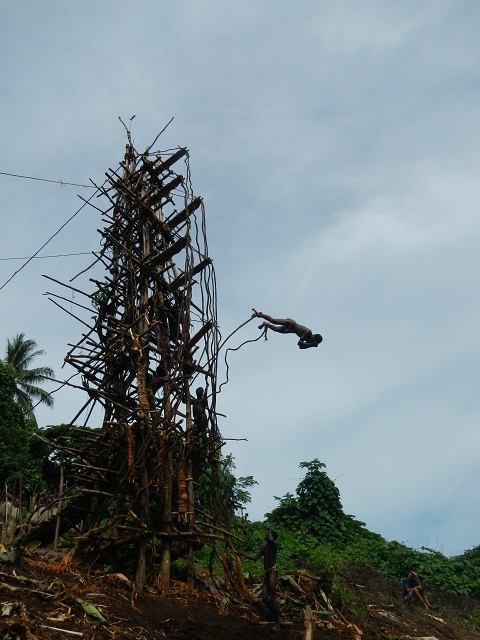 I had heard about the ‘land diving’ ritual and I knew it was somewhere on the pacific islands but had no idea where exactly. 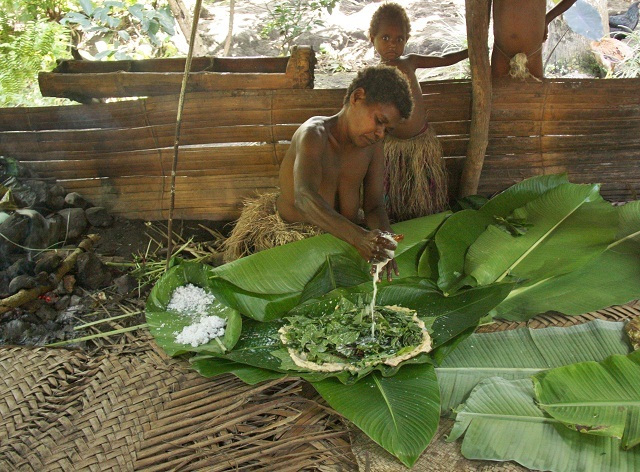 It turns out that this ritual is only performed in 3 or 4 villages on one specific island of Vanuatu; Pentecost. 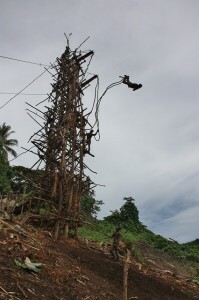 The ritual consists of people jumping from self-made wooden towers (between 20 and 30m high) with only vines attached to their legs to keep them from falling to certain death. As you can see in this movie we made, it is rather similar to the bungee jumping we know now. As a matter of fact, the inventors of the modern bungee jumping have always admitted that they got their inspiration from these people. To see these guys in action you need to time your visit right as it only takes place on Saturday during the months April, May and early June. Reason being that only during these months the vines are flexible enough to jump. In the past on one occasion, the people have been requested to ‘perform’ outside of these months for a visit of Queen Elisabeth and a fatal accident happened when one of the vines broke. 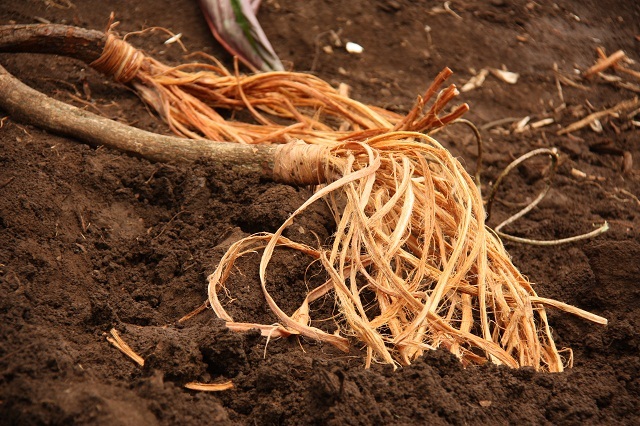 Another reason why the jumps only happen during these months is the fact that it is done to celebrate the yam harvest and to bless the soil for the next seasons. In order for this blessing to be effective the soil must ‘touched’ during every dive, making the whole thing even more dangerous. Surprisingly this last rule didn’t make it in the modern bungee jump version. 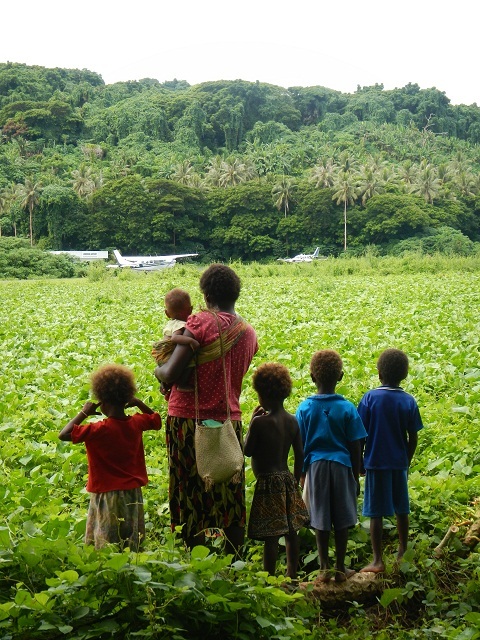 As the ritual only takes place one day a week and the island is only reached by air with a maximum of 4 small (8 seater) planes, it is not that easy to get there. 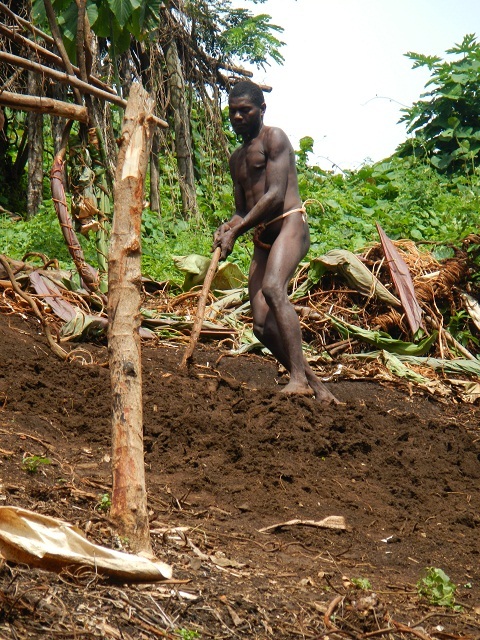 It took quite a bit of effort (and a lot of money) to be able to arrange a trip to this very remote Pentecost island. But we managed to get seats on one of the planes and flew over on Saturday morning. At the airport building (which looked more like a one room concrete hut) we were awaited by one of the village chiefs who (after checking if all had paid the entrance fee) led us to the site of the land diving. 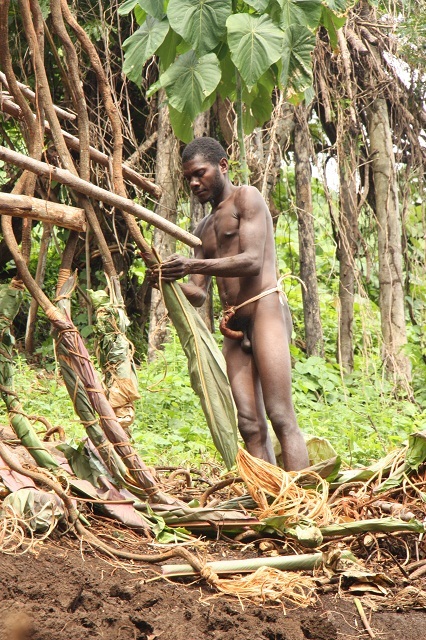 A few hundreds of meters into the jungle a clearing had been made on a small hill on which a wooden tower had been constructed with a whole lot of vines hanging from it. While we walked up to the site we could hear the men and women singing. We had just chosen a good spot to observe when the first boy dove. The young (new) divers use the lower platforms to dive. As the vines are a bit too long for these low platforms, they are the ones that make the hardest landings. But we can confirm that, as the rule requires and whether diving from 2m or from 25m, each and every guy touched the ground in front of the tower. It was a ‘hair raising’ experience seeing these guys jump down head first with only the vines as a protection. Well there is some additional safety in the fact that the ground is ‘loosened up’ with a shovel to make it a bit softer. True this makes ‘touching the ground’ a bit more comfortable but it will hardly be a life saver if the vines break. Sometimes I felt that we were more nervous about the jump than the actual divers. Especially the older and experienced divers were really relaxed about it; cracking jokes just minutes before they had to go up the tower. The ‘main diver’ even jumped twice once from halfway up as a ‘warm up’ for the highest jump. Some of these guys have even found a technique allowing them to land straight back on their feet after the vines have pulled them back. During the whole ceremony the divers were cheered on by the rest of the village dancing and singing at the base of the tower. 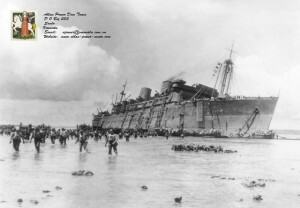 The whole ceremony (about 15 divers) took about 1,5 hr. 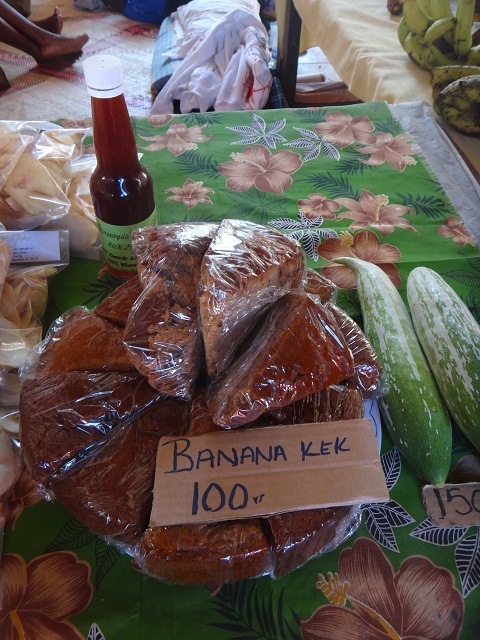 It wasn’t cheap but it was definitely worth flying out to Pentecost just for that. 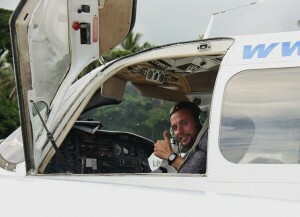 Actually the flight (as are most flights in Vanuatu) was a whole experience itself. How often has it happened to you that the pilot walks you back (“whenever you guys are ready”) through the fields from the beach to the airport? As we were 9 passengers for an 8 seater plane, someone (the heaviest passenger: all of us were weighed before every flight) had to sit in the ‘crew seat’ and that ‘someone’ was yours truly. I had all the same tools as the pilot but I was not allowed to touch anything “until we had come to a complete stand still”. Procedure also required me to put on the headphones so I had the unique opportunity to listen to all the conversations between our pilot, the tower and the different planes. Very interesting but sometimes a little disconcerting! Like when the tower warned us that we were in risk of having ‘contact’ with another plane that had done a rather strange manoeuvre. Our own pilot was a very formal guy with a lot of “negative” and “affirmative” which contrasted a lot with another Aussie pilot that was using some more informal expressions for the same message: “Nope” and “I hear you mate”. Watching the pilot and the instruments and listening to the communications it actually didn’t seem too hard to fly a plane and I almost wanted to ask if I could take over for a while. As we were planning to visit a couple of more islands we had taken a ‘domestic Air Vanuatu pass’. We were not happy to hear that the company had crashed so many planes lately that they needed another company to take over several of their flights. 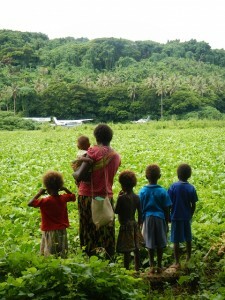 Luckily our flights with Air Vanuatu all went really well. We did however talk to a couple whose plane (not Air Vanuatu) had burst a tyre during landing. Very exciting apparently. Also interesting was the story of a period when all flights to Futuna island were cancelled because the grass on the airstrip was too long. The grass was too long because the lawnmower was broke. But to fix the lawnmower, spare parts had to be flown in … difficult… a bit of a catch 22. On one flight I was sitting next to a gentleman that told me he had been going to Belgium a lot the last years. 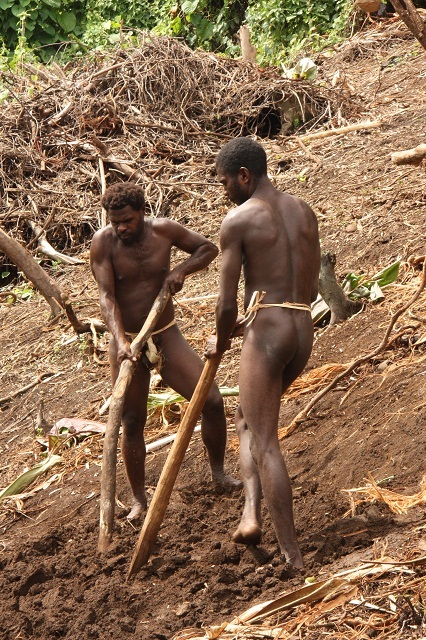 Turned out he was the former minister of trade of Vanuatu and had been in Brussels to negotiate with the EU. He was rather interested in my master thesis on ‘Belgium’s foreign trade policy’ and asked for my ‘business card’. to the bottom if she wouldn’t have been holding on. We got to see parts of trucks, gasmasks, helmets, shoes, a typewriter, a huge pile of bullets. I even posed with a 70 year old US army rifle 35 meter below the surface. I really wished we had had a diving camera because that picture would have been priceless. When we came up we were both completely overwhelmed by what we had seen and quickly decided to come back the next day for more. The next day we would dive to ‘the lady’, a piece of art that sits 40m deep in what originally was the first class dining room. 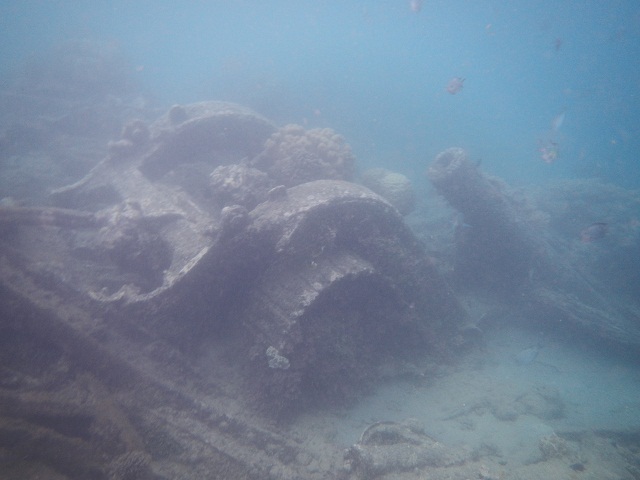 This time we did enter the wreck and did some ‘deep penetration’ as the divers call it. A bit intimidating but again really nice. After checking out the sculpture of ‘the lady’ we started to make our way back up through the lavatories and some smaller cargo holds where once again some really cool artefacts could be seen. I was really impressed with one jeep we came across that was really well preserved. Unfortunately that would be our last dive as we would be flying 26 hours later. 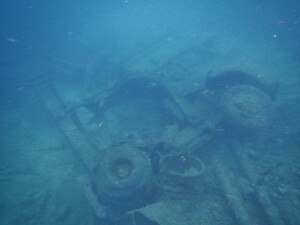 If anyone is interested in diving the wreck they should get in touch with ‘Allan Power diving’. Allan came to the ship to work as a salvage diver in the early 70’s and never left it afterwards. 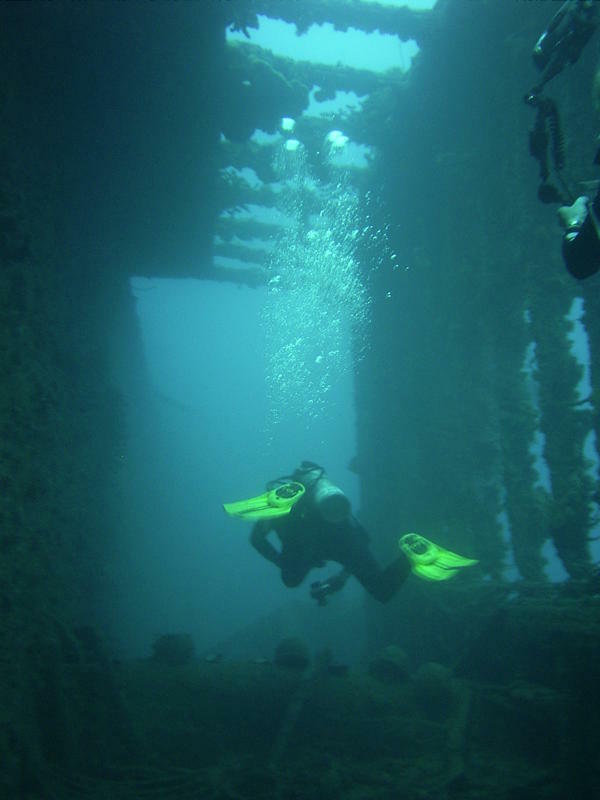 He was the first to organize commercial diving and now in his 80’s he still does. 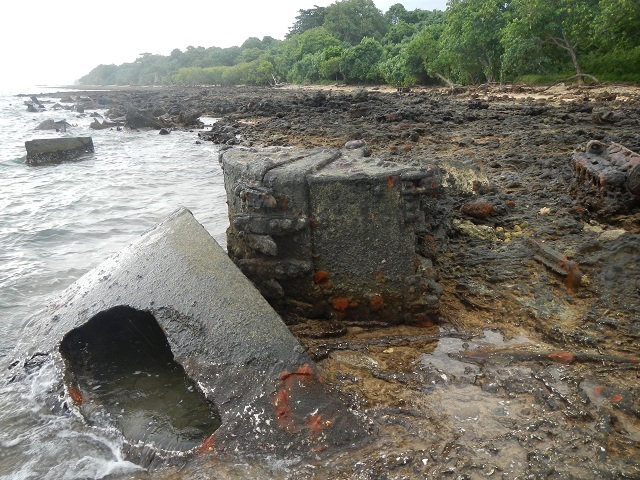 The other major WWII site in Santo is ‘Million dollar point’. At the end of the war the US army had a lot of material left that they did not wish to transport back home. 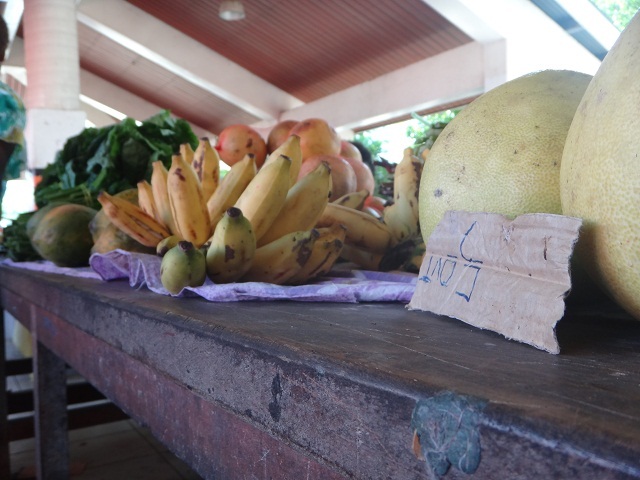 As most of this material could well be used on the island, they offered it for sale to the governors of Vanuatu for a very small sum. 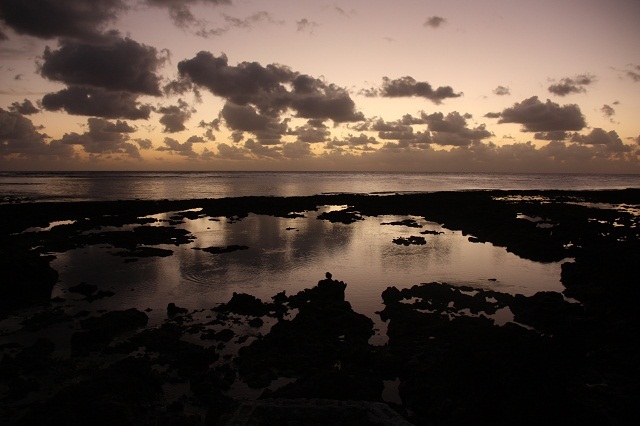 However the islands of Vanuatu were governed by the French and English governments and these two did not manage to agree on who would pay the bill. In the end the US just dumped all of this material in the sea and it is still there. 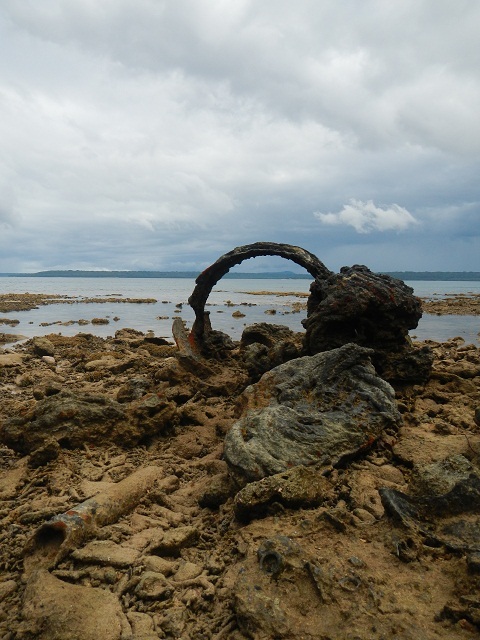 We went snorkelling for a couple of hours and came across bulldozers, canons, boats, fork lift trucks, cranes, medical supply bottles, all kind of construction material and thousands of broken Coca Cola bottles. A shame that all that material was wasted but it serves as a nice underwater museum now. 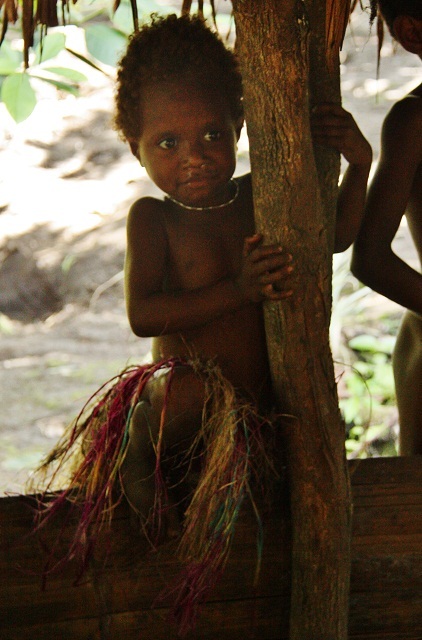 The fact that Vanuatu was until its independence governed by two countries has had some strange consequences. For example people could individually choose which law they would obey to. That included the traffic rules from either UK or France. You probably worked out that this resulted in some rather tricky situations given the rather important differences in traffic rules between both countries. Another remarkable effect of this period is that a lot of people on the island now speak really well English or French depending on the school they chose. We met a guy fluent in English but he did not understand a word of French, while his sister was just the opposite. 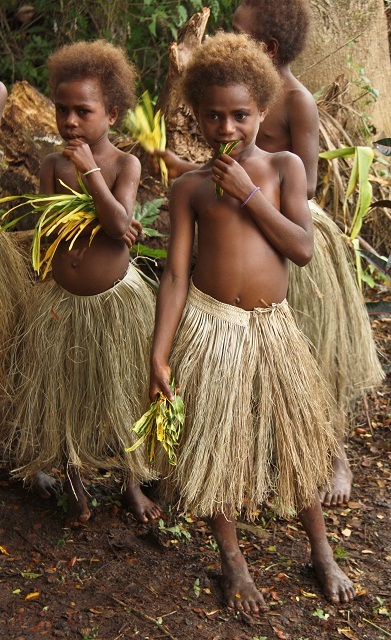 The first language of most inhabitants of Vanuatu is one of the dozens of tribal languages on the Islands. 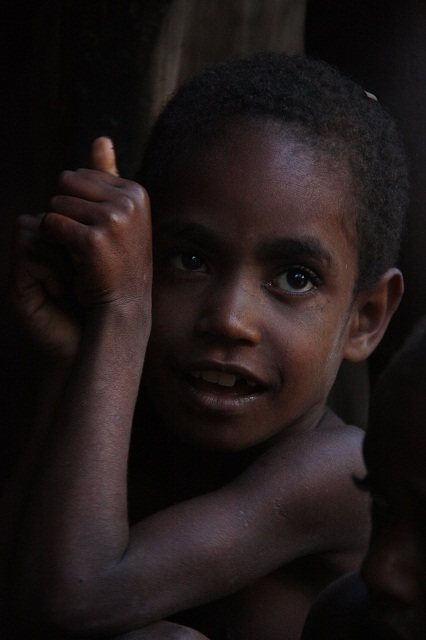 They use a language called ‘Bislama’, as a common language to make sure that people from different clans/islands can communicate. 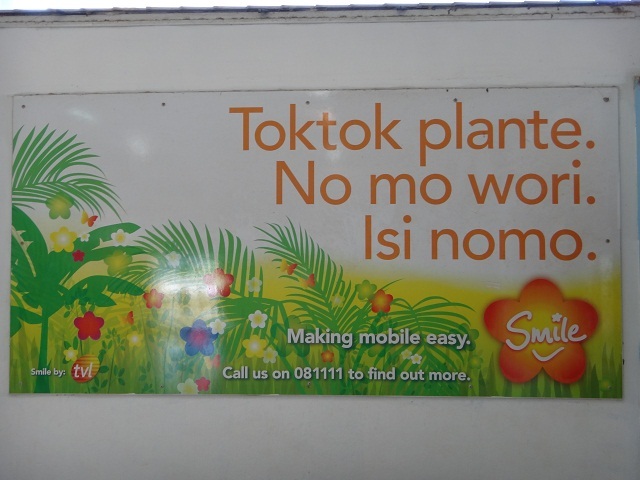 Bislama is a simplified and phonetic version of English which is funny to read but rather hard to understand when spoken. After all the underwater action in Santo we hopped on a plane to Tanna island in the South. 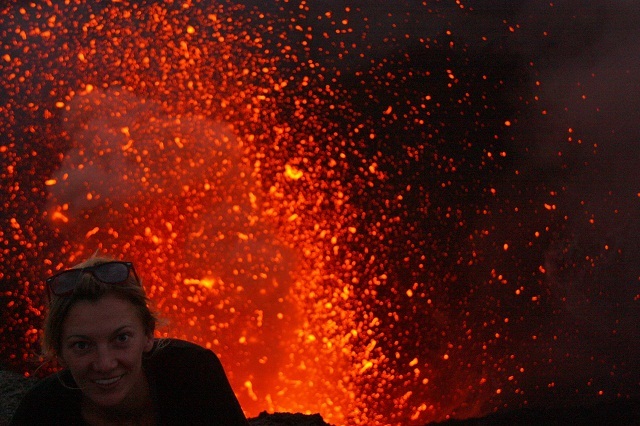 Tanna is known by most travellers for the (very) active volcano Mt Yasur. But it is also one of the most traditional and authentic islands of Vanuatu. 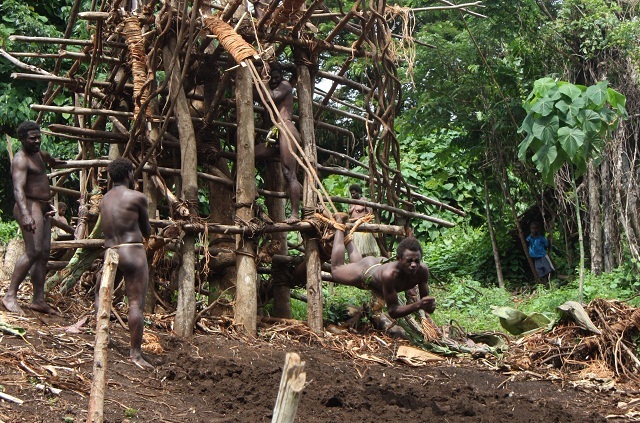 In most villages people still live, the way they lived 200 years ago. 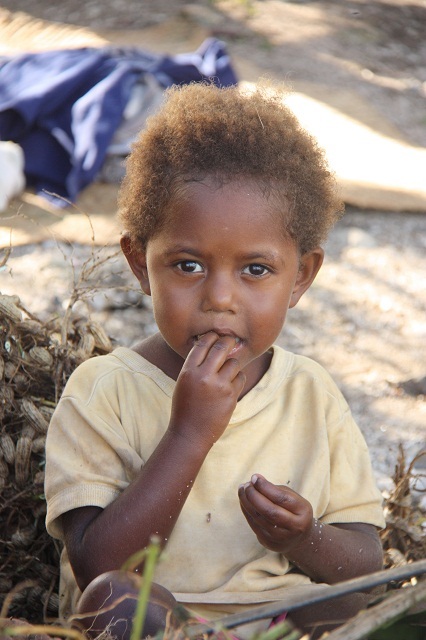 Contrary to what a lot of people think, the people in these so called ‘kastom’ (Bislama for ‘custom’/tradition) villages’ don’t live that way out of poverty (some are actually very rich) but out of choice. 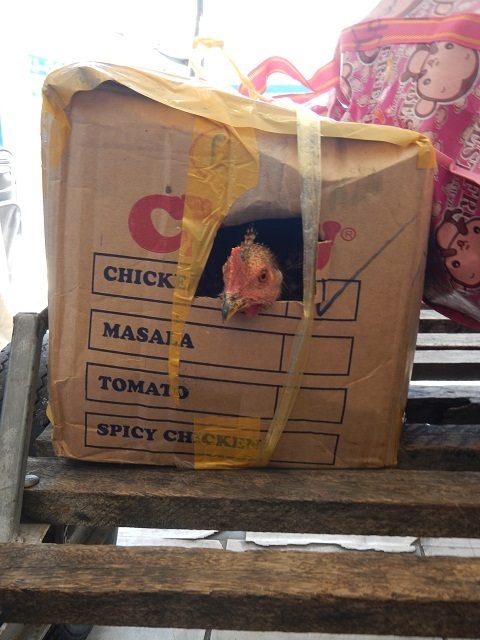 They simply do not wish to live in the ‘modern world’. You come across them all over the island and some of them are really keen to meet foreigners and explain about their culture. 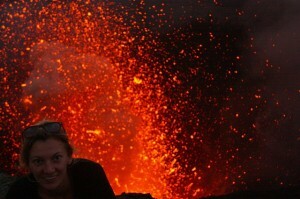 But the real reason we came to the island was the volcano. 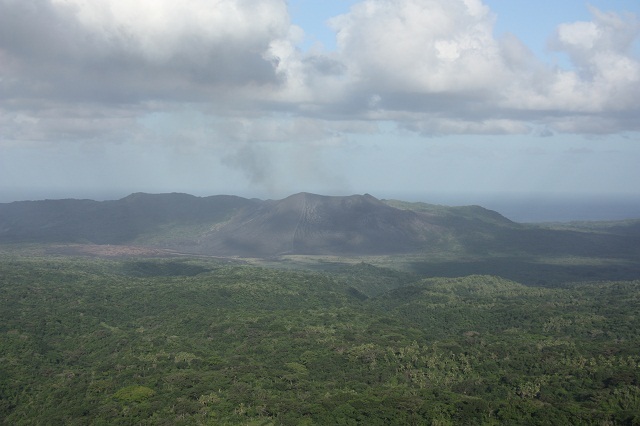 On this and other trips we have been hiking on and around several volcanos. 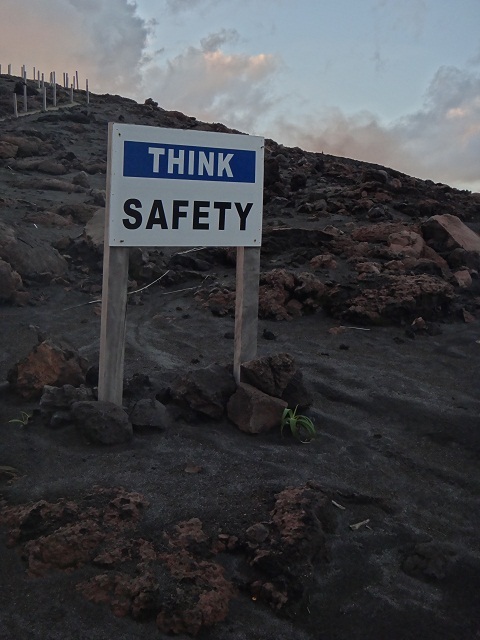 However so far we had never seen any lava in the craters. Always a lot of sulphurous smoke but none of the real ‘red hot stuff’. 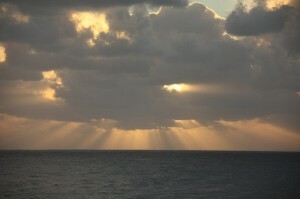 But that was about to change in Tanna. We learned that Mt Yasur, one of the most active and most monitored volcanoes in the South Pacific, is erupting almost constantly and in a pretty spectacular way. To get there you need the cross the whole island and descend from the lush green hills into a lunar landscape shaped out of ash and lava. 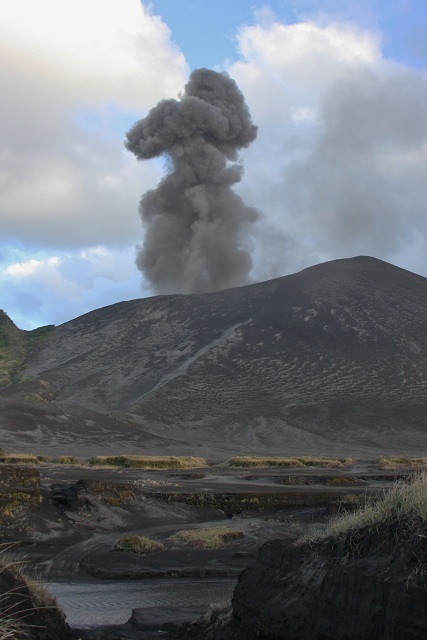 Once we arrived near the ash plane we started seeing black clouds coming out of the crater and heard big explosions at very regular intervals. As we got closer the explosions got louder and louder. At times you could see rocks flying through the air. Our 4WD brought us almost all the way up to the crater where we met our ‘guide’ for a safety briefing. He explained that we would first evaluate in which direction the eruptions happened in order to choose the right viewing point. The most important messages however were “always watch the rocks that are flying highest cause they may fall on your head” and “don’t run, you will not be able to run fast enough and you will probably fall and hurt yourself”… While he was explaining this we felt the earth shake beneath our feet and heard a big explosion, a fraction of a second later we saw red hot rocks flying high above the crater edge. After the safety briefing, everybody rushed up to the edge of the crater to get a good view of the spectacle. And what a spectacle it was. The big crater was divided into two smaller craters that were spitting out lava and rocks in turns. There was an almost constant flow of small explosions. Small as in the flying rocks stayed within the crater on which edge we were standing. But when one of the craters was not spitting for a while, you knew something ‘big’ was coming. 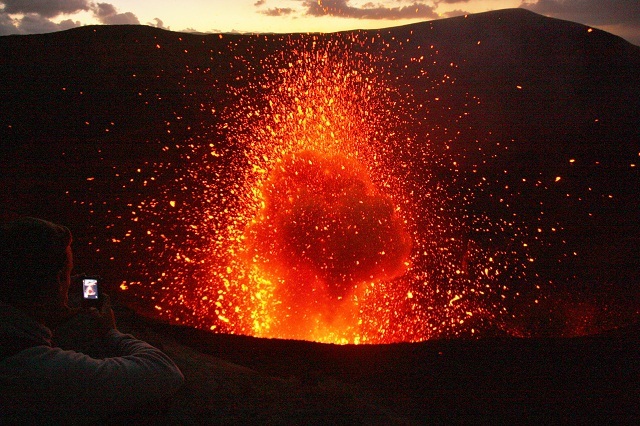 All of a sudden the earth would start to shake, a flash of fire came from the crater and BOOM! A huge explosion sent rocks flying way outside the crater up to 80m high in the air. What a spectacle! 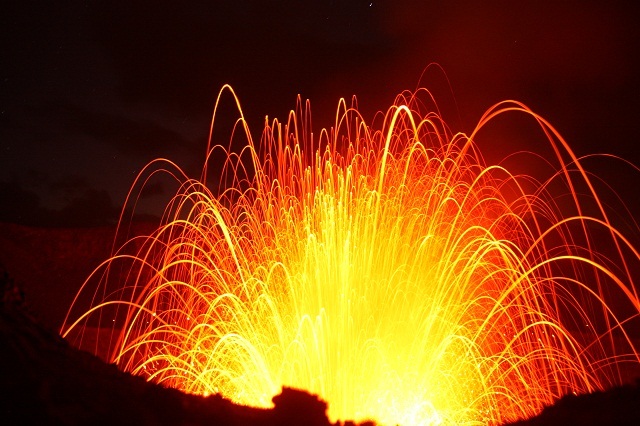 Have a look at this small movie of two eruptions that evening. Luckily none of the rocks came in our direction. 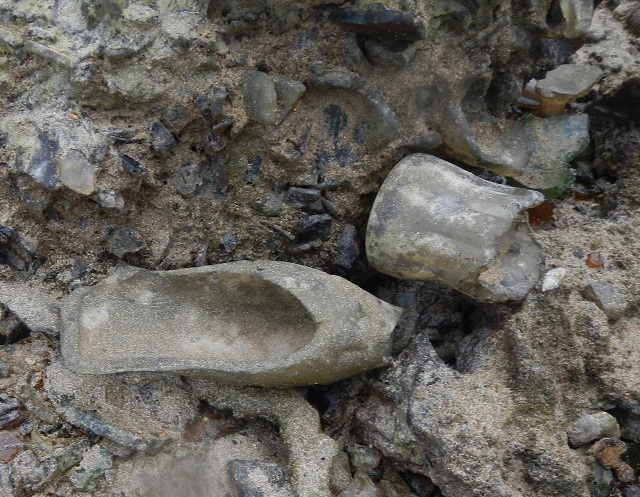 But some of the rocks landed in a spot where as the guide explained they used to take travellers until a couple of years ago when an accident happened. 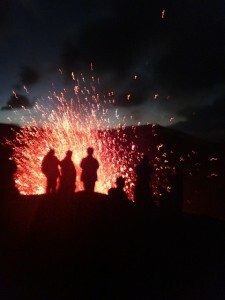 As it got darker the spectacle got even better with the red lava just like fireworks, flying in all directions. I could have watched it for hours more but as it got really dark and the activity was picking up, it got too dangerous to stick around longer so we headed back to the other side of the island. It had been an amazing experience that I would put all the way up there with our whale encounters in Antarctica. 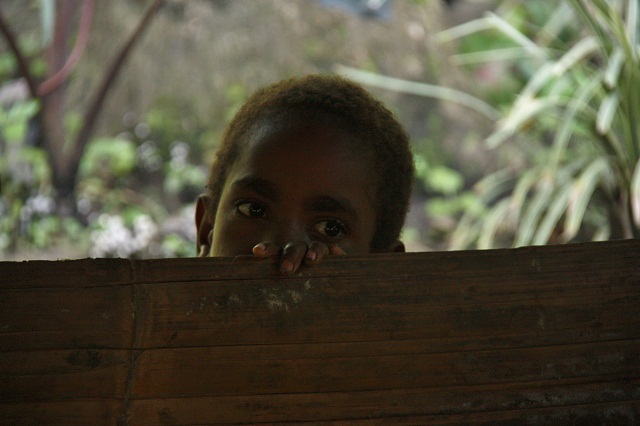 Looking back at it, it have been 9 crazy days in Vanuatu. Not too bad for a little side trip that was added ‘last minute’. 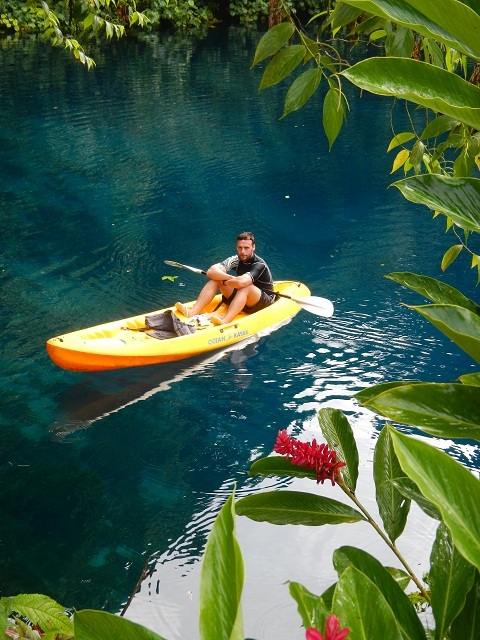 And there is so much more to see and do in Vanuatu; cannibal sites, volcano trekking, more diving. I hate to sound like a broken record but I guess we will have to come back here also. * For those interested in WWII in the Pacific, a nice introduction to the war in this part of the world could be the excellent HBO TV series ‘the Pacific’ or Clint Eastwood’s movies ‘Flag of our fathers’ and ‘Letters from Iwo Jima’. 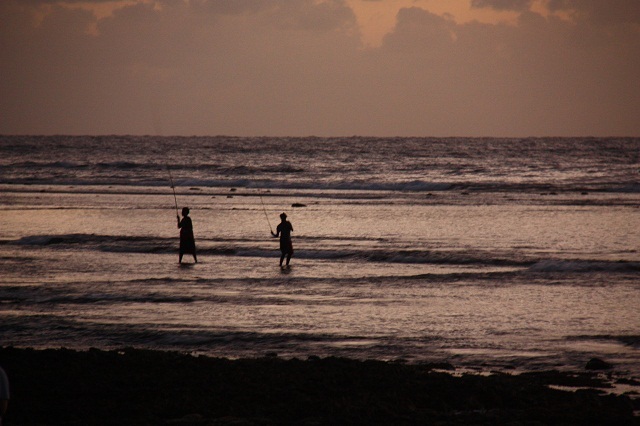 This entry was posted in South Pacific, Vanuatu by Jan De Roeck. Bookmark the permalink. Water, vuur, aarde en lucht… je zag het allemaal van zo dichtbij dat deze reis een onuitwisbare “vulling” in je hoofd en hart zal zijn… om nog te zwijgen van alle mensen die je pad deelden. ..
Niet alleen mijn aardrijkskunde, maar ook mijn geschiedenis is er met je blog alweer op vooruitgegaan. Merciekes!